The preview for ‘Reflections’ at Birch Tree Gallery went well, and I was very pleased to meet my fellow exhibitor, Suzie MacKenzie; so pleased in fact, we bought one of her lovely prints. 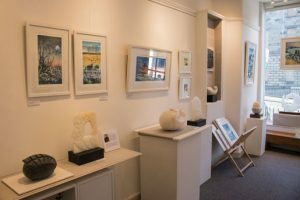 Birch Tree Gallery owner Jurgita Galbraith has displayed everything beautifully and both prints and sculptures work very well together. ‘Depth Charge’ sold at the preview and is now off to a good home. The exhibition runs until 28 February.